Would you like to add navigational features to PDF documents exported from your reports? This article will give you a startup on how to do this using eDocEngine VCL. PDF documents support features to facilitate navigation through the pages of the document. One such feature is bookmarks. Using Gnostice eDocEngine, you could export your reports to PDF and while doing so, you could also add bookmarks to the PDF document. This will enable user of the PDF documents, your customers, to browse through the PDF document with great ease. This article will provide you with an example of how this can be done. The following example demonstrates using PDF Engine component along with Rave Export Interface component to export the Rave reports to PDF and also to add bookmarks to the PDF. However, you could use the same code to achieve this with other reporting tools. Drop the gtPDFEngine component on the main form of the project from the "eDocEngine" palette in Delphi. Drop the gtRaveExportInterface component on the main form of the project from the "eDocEngine Additionals" palette in Delphi. Connect the Engine property of the gtRaveExportInterface to gtPDFEngine. Set the properties of PDFEngine if required. See screenshot. Handle the OnBeforeEndPage event of gtPDFEngine to write code for adding bookmarks. Use the Sender parameter in the event handler to access other Engine properties. Run the project and export the report to PDF. See screenshot. 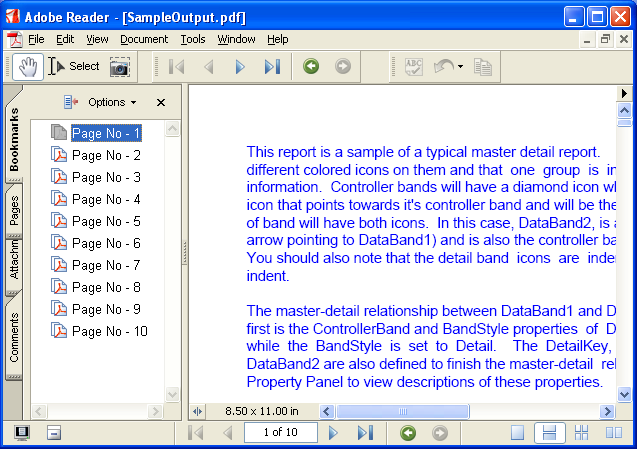 Open the generated PDF in Acrobat Reader. Choose View | Navigation Panels | Bookmarks menu option to open the bookmark panel. You should now see the bookmarks linking to the pages in the PDF. See screenshot. NOTE: You would require the minor bug-fix on the version 2.43 of Gnostice eDocEngine, for this tip to work correctly. If you have not received this fix, please get back to Gnostice Support with your order details. Multi-format document-processing component suite for .NET developers. A .NET PDF component suite to create, edit, view, print, reorganize, encrypt, annotate, and bookmark PDF documents in .NET applications. Multi-format document-processing component suite for Delphi/C++Builder developers, covering both VCL and FireMonkey platforms. A Delphi/C++Builder component suite for creating documents in over 20 formats and also export reports from popular Delphi reporting tools. A Delphi/C++Builder component suite to edit, enhance, view, print, merge, split, encrypt, annotate, and bookmark PDF documents. Multi-format document-processing component suite for Java developers. A Java PDF component suite to create, edit, view, print, reorganize, encrypt, annotate, bookmark PDF documents in Java applications. Privacy | Legal | Feedback | Newsletter | Blog | Resellers © 2002-2019 Gnostice Information Technologies Private Limited. All rights reserved.